Some of our personal documentary work in the Inland Empire, CA. The May 2014 edition of prestigious wealth management journal "Trusts and Estates" carries an article Your Story Here wrote on the subject of legacy planning in the digital age. "The project can be as simple as a collection of scanned letters or photographs," she co-writes with Orange County identity Victoria Collins, "as insightful as an ethical will or as comprehensive as a personal or family history documentary." Bee's personal history documentary revealed our Bee's Facebook interest! Our 92-year-old Bee's on Facebook (and in the news)! We were lucky enough to meet and film Bee Gibbs in early 2011. At age 92, we discovered she is one of the oldest people on Facebook. Bee's story made front page news here in Southern California. 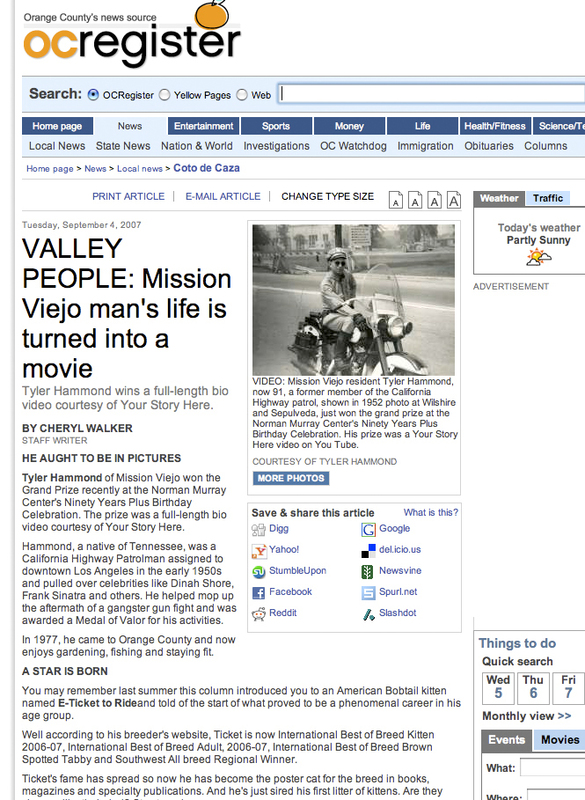 Was being the feature story in The Orange County Register too "old media" to impress our thoroughly modern Bee? Well, Bee had very wide tastes and was not above throwing a glance towards a broadsheet from time to time. Some interview subjects have very difficult life stories to tell. 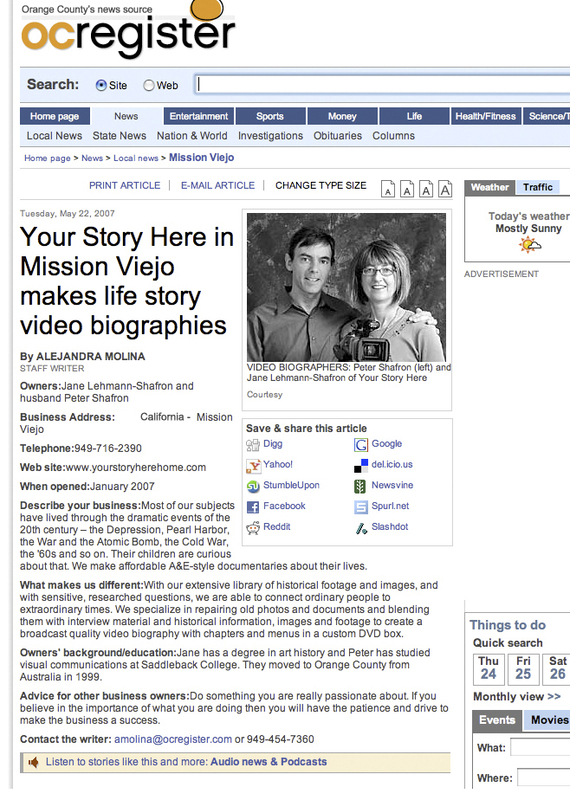 Laguna Woods' senior Inge Papich's difficult story, revealed by us in our personal documentary "Growing Up Mischling", becomes front page news. That film was an official selection in the Newport Beach Film Festival 2010 and won "Best Short Documentary" in the 10th Annual Lake Arrowhead Film Festival plus a 2009 Telly Award. Click here to see the opening minutes of that personal history video documentary. 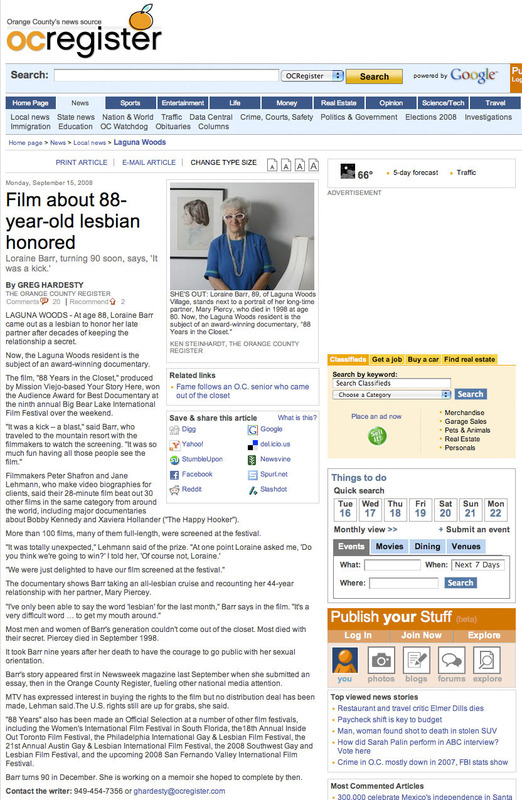 Our video biography of Loraine Barr entitled "88 Years in the Closet" received the audience award for Best Documentary at the Big Bear Lake International Film Festival. It was an official selection in the Women's International Film Festival in Miami: WIFF page. As well as the Inside Out Film Festival in Toronto: TIO page. And was selected to feature at film festivals in Philadelphia, Austin, Santa Fe and Los Angeles. The film is currently playing on PBS channel KOCE-OC. 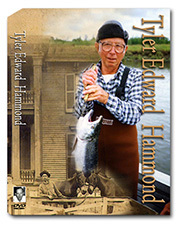 The DVD box cover for Tyler's life story documentary. Tyler Hammond brushed shoulders with Hollywood royalty as well as LA gangsters as a California Highway patrol man in the 40s and 50s. Our personal history documentary about Tyler Hammond's life was featured in the Orange County Register. Our goal is to plan, film and edit family history and personal documentaries to the highest standards. Our attention to detail is second to none - in each of the pre-production, production, and post-production phases of the project. Of course, our task always starts with your unique needs. We listen. Our work has been recognized in film festivals in the USA as well as Canada. And our business, and our clients' stories, have often been featured in the news. Family history and personal documentaries from Your Story Here LLC. 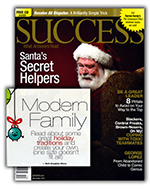 Jane Shafron,co-founder of Your Story Here LLC, was featured in the December 2011 issue of "Success" magazine talking about holiday traditions for the modern family. 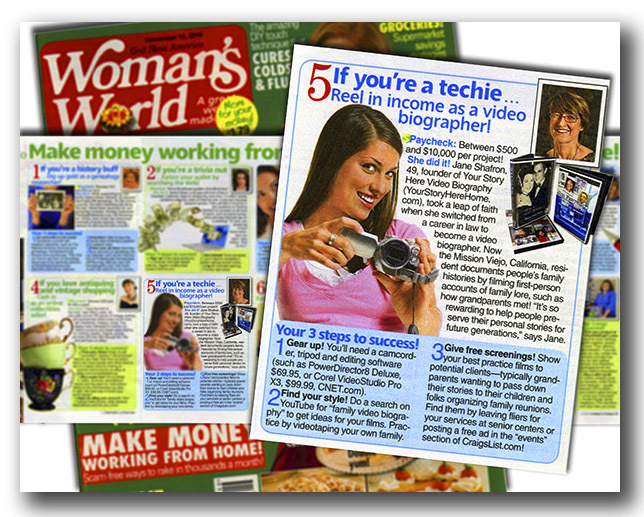 Co-founder Jane was also featured in the November 15, 2010 issue of national woman's magazine "Woman's World" as part of a piece about women who have made a success of small business. "Millions of people read Woman's World every week - often, like me, in the supermarket line! So the exposure for Your Story Here Video Biography is fantastic." Jane credits her success to her personal approach to her business. "It starts with my website," she said. "My picture is on every page! So people know exactly who they are dealing with." Tom Patty is not the sort of man to do things by halves. His career as an adman gave him clients like Nike, Nissan and Pizza Hut. When he retired from Chiat/Day Advertising in 1998 he was President and Worldwide Account Director. "My wife wants a large garden in the North West. I reflected on that for a long time," says Tom. "In truth, the whole world is Susan's garden. She cares for a large circle of friends and family just as she would care for her garden. I wanted someone to help me turn that concept into a gift." 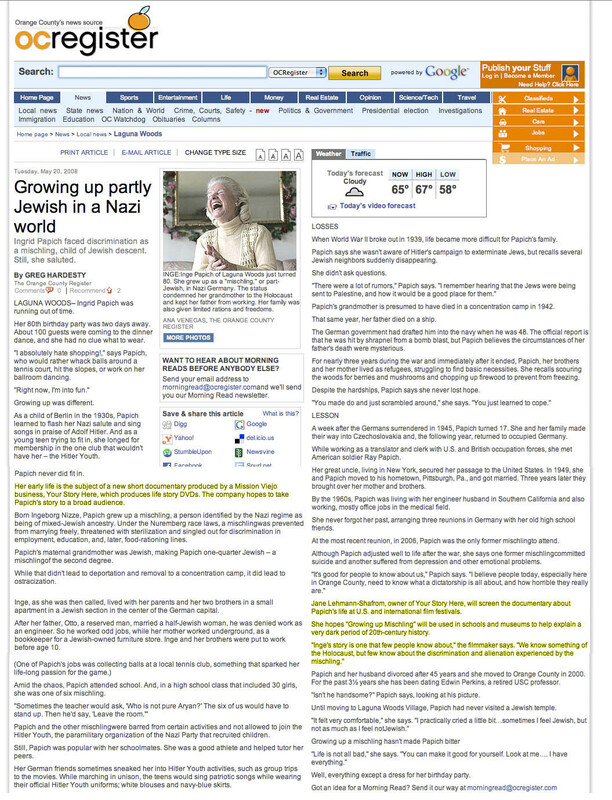 Your Story Here Featured in December 2011 edition of Industry Journal "Preservation Chronicles"